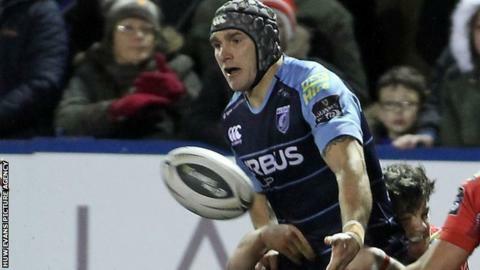 Tom James has enhanced his hopes of a Wales recall with "outstanding" form in recent weeks, according to Cardiff Blues coach Danny Wilson. Wing James conceded a try from an intercepted pass against Scarlets on Friday, but his breaks then set up two tries as the Blues fought back to win. The 28-year-old won the last of his 10 Wales caps in 2010. "He's playing really well and I'd like to think he has given some selection headaches [to Wales]," Wilson said. "He's been outstanding for a number of games for us this season and credit to him, he threw an intercept pass that he'd be disappointed with, but the game he had after that was superb." Having been in the international wilderness for five seasons, James was a surprise inclusion in Wales' World Cup training squad. But a foot injury meant he was unable to train over the summer and he was eventually released to his region in early August for further treatment. He was fit enough to start the first game of the Pro12 season for the Blues, scoring a try against Zebre, but limped off after 38 minutes and was out for the next eight weeks. James has been ever present since his comeback in late October, adding another four tries and catching the eye on several occasions. With just over a month to go until the start of the Six Nations, James' latest fine display came in front of Wales assistant coach Rob Howley at the Arms Park. He set up Dan Fish for the Blues' second try, and made another crucial break down the left flank before Cuthbert burrowed his way over the tryline to give the Blues a shock 29-27 win over Pro12 leaders Scarlets. "Tom James played particularly well," said Howley. "When he had the ball he created opportunities and looks quite sharp." Howley said he had also been impressed by the performance of Rhys Patchell, who converted Cuthbert's try to secure victory. "He's a young talent," he said of the twice-capped 22-year-old fly-half or full-back. "He controlled the game in the second half and landed a superb conversion from the touchline. He's got a great kicking game and the ability to put others in space."